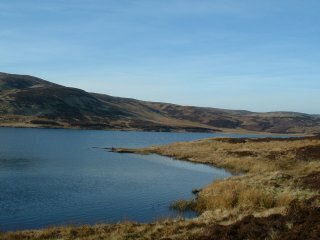 Situated in the heart of Clyde Murshiel Park, Queenside Loch is a typical hill loch. Small brown trout predominate, but fish over the pound mark are present and occassionally caught. 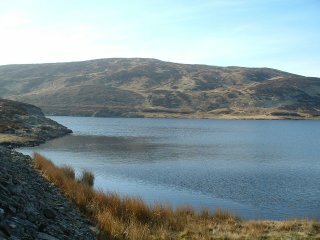 The loch is a good forty minute walk from the visitors car park and should only be undertaken by those of a robust nature, the views and the fishing make it a worthwhile walk. Ask for directions from the visitor centre or just follow the path, over the River Calder and on for about 1 mile. 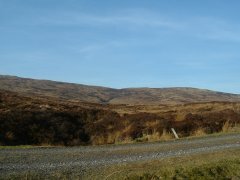 Look out for the white post on the left hand side of the path (see picture) and follow the burn up to the loch. Typically it fishes better on a bright calm day with small black bushy flies a good starting point. Early morning and late evening provide the best sport with the trout very free rising if the conditions are right. For further information please contact Tom Sprought, St.Winnoch A.C. secretary on +44 (0)1505 842186 or email the club at info@LochwinnochAC.net.